We are committed to continuously improving access to our goods and services by individuals with disabilities. This website is currently being updated to enhance the usability and experience for persons with disabilities. If you are unable to use any aspect of this website because of a disability, please call 781.246.2211 and we will provide you with prompt personalized assistance. Fluoride is a naturally occurring mineral that has been utilized for many years to help prevent tooth decay. Tooth decay begins when the bacteria and sugars present in the mouth form acids that erode the tooth’s protective enamel. These acids cause minerals to be lost from the tooth’s enamel layer, a process called demineralization. Left unchecked, this can lead to the formation of holes (cavities) in the teeth. Fluoride helps strengthen the teeth through process called remineralization wherein the mineral bonds to weakened areas of tooth enamel. It also disrupts acid production, helping to inhibit the process that leads to tooth decay. Fluoride can benefit people of all ages. Children who get adequate fluoride while their teeth are still forming will develop permanent teeth that are stronger and more decay-resistant over a lifetime. 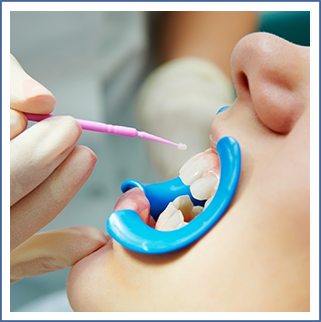 Adults who are particularly susceptible to tooth decay also benefit from fluoride application. While fluoride can help reverse early tooth decay and prevent cavities, it cannot heal cavities that have already formed. Therefore, it is a great and cost-effective strategy for maintaining dental health and preventing more expensive problems later on. Don’t we get enough fluoride already? Because the benefits of fluoride are widely recognized, the mineral is added in low concentrations to drinking water in many areas. It is also an ingredient in most toothpastes. However, children and individuals at increased risk of tooth decay can benefit from fluoride treatments that contain a much higher concentration of the mineral than is present in drinking water or in over-the-counter products. This type of treatment is only available from your dentist. Who will benefit most from fluoride treatment? Children whose permanent teeth have not yet developed. Early exposure to fluoride during childhood fortifies the permanent teeth before they even emerge, leading to teeth that are stronger and more decay-resistant for a lifetime. Individuals with dry mouth. Saliva helps neutralize acid and protect the teeth. Therefore, those with conditions that cause dry mouth (including diabetes, Sjogren’s syndrome and conditions that require radiation therapy) or who take certain medications (such as drugs for allergies, depression and high blood pressure) can benefit from fluoride treatment. Those with a history of cavities. These individuals may be more susceptible to future decay. Those with poor dental hygiene. Illnesses or conditions that limit one’s ability to brush or floss regularly can lead to the buildup of plaque and tarter, causing tooth decay. Individuals who have crowns or bridges. Their teeth are particularly susceptible to decay at the point where the restoration meets the tooth. Individuals with braces. Braces can trap food, making it harder to floss and brush adequately. Frequent snackers and those with a high-sugar diet. Increased exposure to plaque and bacteria puts the enamel at greater risk. Bottled-water drinkers and others who don’t get enough fluoride. Fluoride has been in use for many years and has been approved as safe and effective by most major health and safety organizations. Although excessive amounts of fluoride for prolonged periods of time can harm the teeth and bones and, very rarely, cause more serious problems, your dentist will ascertain whether you are a candidate for a fluoride treatment. The fluoride applied during a fluoride treatment is safe and effective. Only one appointment is required for a fluoride treatment. Your dentist will put a flavored fluoride gel or foam into a tray that resembles a mouth guard. This tray will be kept in the mouth for one to four minutes, after which you may spit the solution out. You will then be asked to refrain from drinking, eating, smoking, or rinsing for 30 minutes. Some dentists use a different type of fluoride, called a varnish, which is painted on to the teeth rather than used with a tray. At Lynnfield Dental Associates we use the latest technology and finest materials to offer fluoride treatments that are quick, comfortable, and effective. We will provide instructions for the care of your teeth after treatment. While fluoride can help reverse early tooth decay and prevent cavities, proper oral hygiene, good eating habits and regular dental visits are necessary to aid in the life of your teeth. Feel free to contact us if you have any questions about fluoride treatment or to schedule an oral health consultation with one of our dentists. © 2019 Lynnfield Dental Associates All Rights Reserved. at 781.246.2211 or complete the form below. Here at Lynnfield Dental Associates, we work diligently to protect our patient's rights and privacy. Requesting an appointment via our Internet portal is considered part of what HIPAA has identified as electronically protected information (ePHI). Unfortunately, despite the best efforts we make or take, there are people or entities that may attempt to intercept the data you transmit to us. By checking the box, and electronically making an appointment, you understand that you are making an appointment over the internet and that Lynnfield Dental Associates will keep this information confidential but cannot guarantee that others, outside of our practice, may not illegally intercept this communication. As a result of continuing, you are sending this transmission and accepting the inherent risk(s) associated with making this request for an appointment. As an alternative, you are always welcome to contact our office via telephone to schedule your appointment.